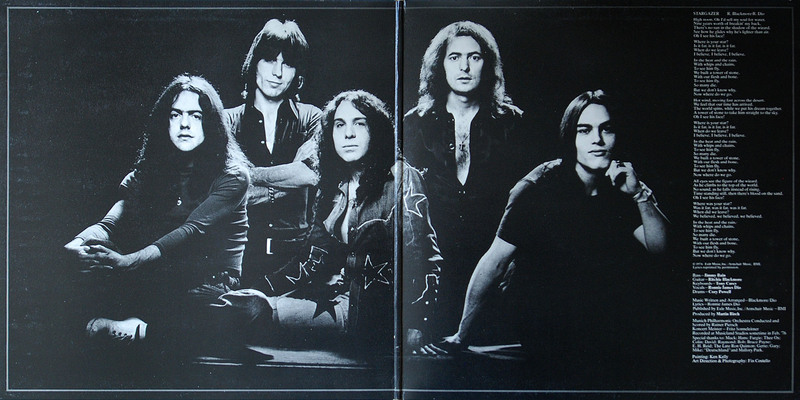 Regarded by many as Blackmore’s finest work…ever. This was the dark, brooding, guitar-led opus that many expected upon his departure from Deep Purple in 1975. The front cover illustration has a darker, more mystical feel about it than the slightly whimsical ‘guitar-as-castle’ design of the debut LP. 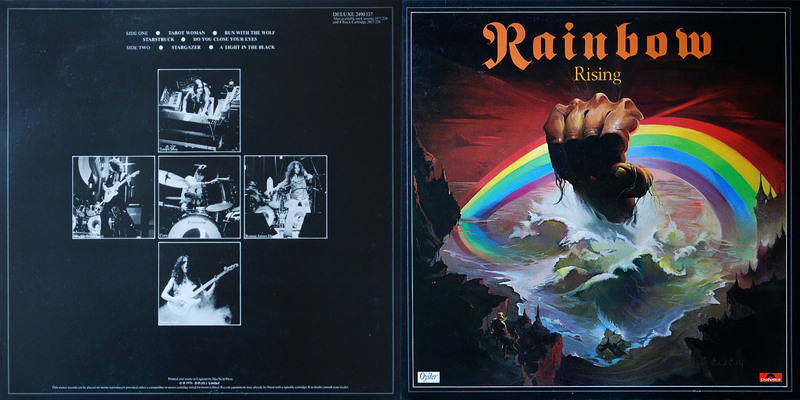 The fist emerging forcefully from a stormy sea, clutching the rainbow; a new logo design, more gothic in feel and typeface than the debut design; the very name of the album – ‘Rising’ – suggesting that this was the real ‘new Blackmore’ that we’d waited to see and hear. The inner photo features a very moodily lit band portrait, hinting at the atmospherics of the songs. All setting the scene and raising the expectations of the music. We were not to be disappointed. ‘Tarot Woman’ opens the album with an eerie keyboard intro, thankfully nothing like the non-existent Mickey Lee Soule efforts on the debut, and radically different from the distortion-drenched Hammond of Jon Lord. The vibe seems somehow different on the album immediately the whole band starts the track proper. The production is brighter, yet more atmospheric. Martin Birch has sole production credit on this album, so maybe he was allowed to do his job properly without interference from Blackmore and Dio this time…whatever, he did a superb job. The band’s delivery is sublime, both in composition and performance. 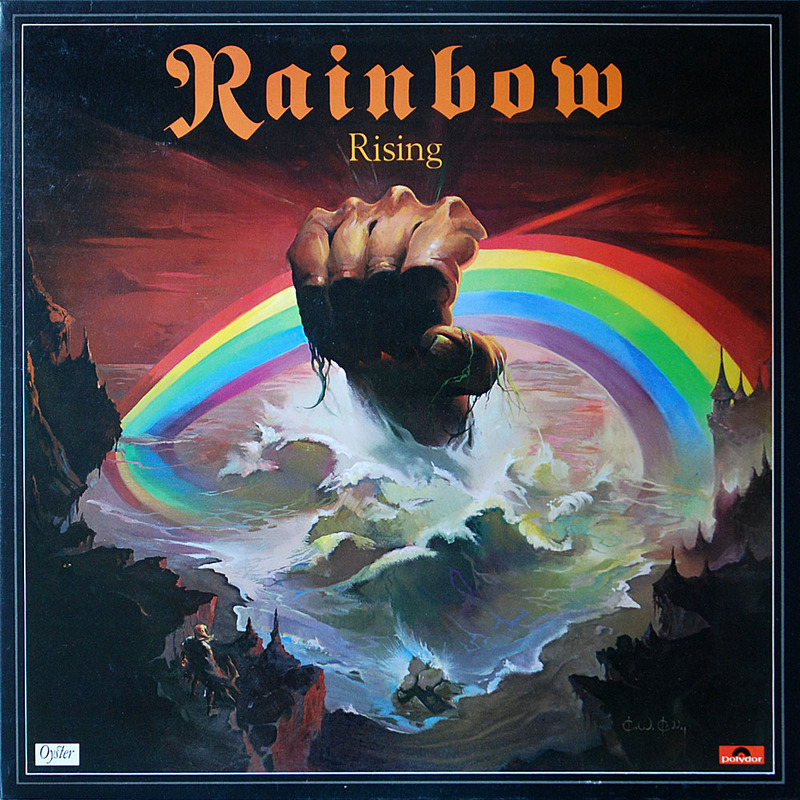 The lyrics are mystical and mysterious, the vocal is powerful with great melody, the guitar is forthright and prominent yet does not over-dominate, the keyboards are present and complementary, the drumming is powerful and accents the song in ways that were completely absent from ‘Ritchie Blackmore’s Rainbow’. A stunning opening track. ‘Run With The Wolf’ continues in a similar way, again referring to darker forces and mysticism. A punchy riff and rhythm dominates, but well paced and with more energy and dynamism than similar tempo-ed songs from the earlier album, thanks primarily to powerhouse drum fills from Cozy Powell. ‘Starstruck’ lifts the standards even higher with a phenomenal opening guitar riff, accented by bass and drums, beautifully harmonised with additional guitar overdubs. The song content might be a little lighter in tone than the opening tracks (referring to a starstruck fan who’d been stalking Blackmore) but the composition and arrangement is again of the highest quality. Which leads on to ‘Do You Close Your Eyes’. Back to basics with a 3 chord rocker that whilst a decent enough track doesn’t seem to belong with the opening numbers, although it would serve very well in a live format as an uptempo number to give Blackmore some freedom for guitar histrionics and demolitions for several years. The lyrical content is also fairly simplistic in sentiment and the track might have been intended as a single, it sounds like there’s even handclaps in the choruses! Side 2 opens with an impressive drum fill and guitar pick scrape down the strings to create an original and eerie sounding introduction into one of Blackmore and Dio’s finest ever compositions. 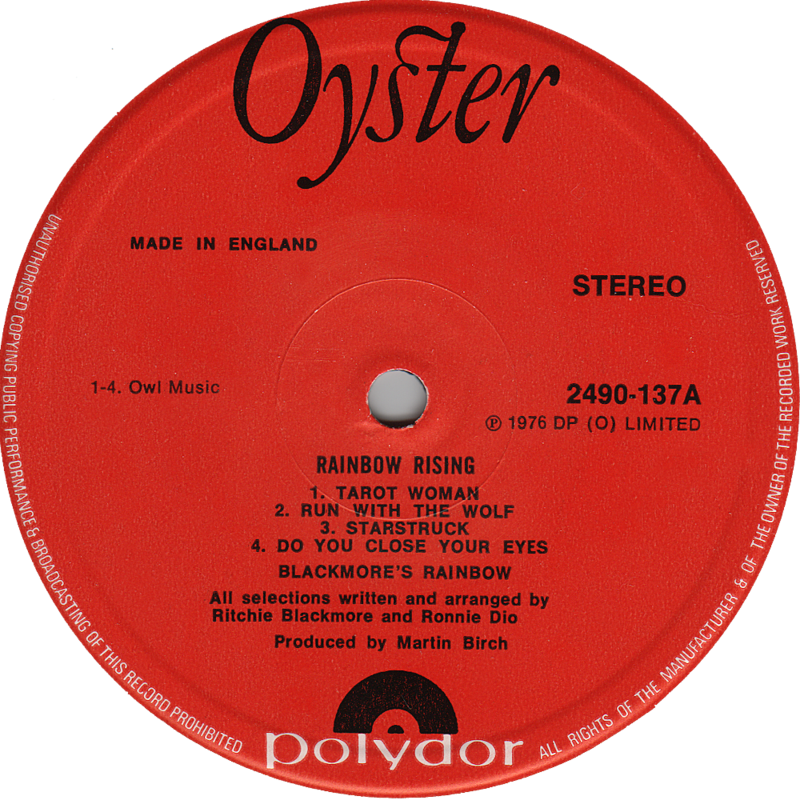 ‘Stargazer’ must surely rank as No.1 on anyone’s list as Rainbow’s greatest epic…Interestingly however, there is a bootleg copy of this album known as the ‘rough mix’ that features the original keyboard intro missing from the final mix. Maybe they decided they’d already done that on side 1, and upon hearing it, it does sound too similar to ‘Tarot Woman’ so probably a wise decision. The song hints at the design of the front cover with a darkly silhouetted castle and windswept long-haired figure on the cliff edge. Is he the wizard in the song? Or perhaps the Dio-hero singer of the song? Whatever, the song is a masterpiece of composition, arrangement, production and performance. Finally, Blackmore lets rip with a stunning guitar solo. Dio’s vocal performance is immense. Cozy Powell’s drumming cannot be praised too highly. Even the keyboards are given sufficient presence to enhance the atmospheric mood of the track. 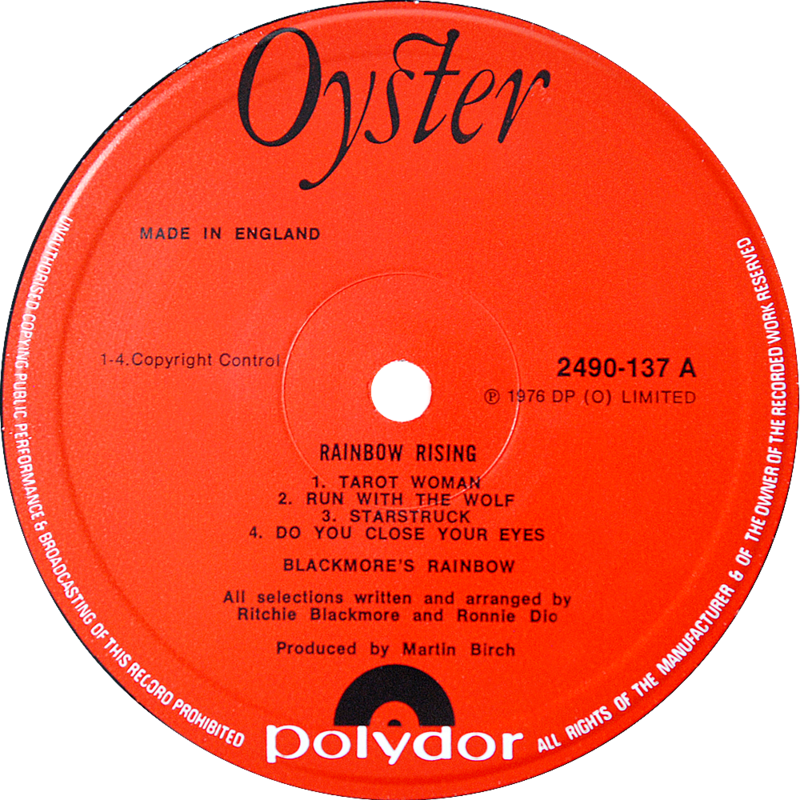 The orchestral arrangements too, and not for the last time on a Rainbow album, create a huge presence about the track with Blackmore stating that Led Zeppelin’s ‘Kashmir’ had influenced the ending few minutes of ‘Stargazer’. Epic is probably an understatement. ‘Light In The Black’ was originally known as ‘Coming Home’. And whilst it is a bit more of a straightforward rocker than the track before, it still has a quality about it that elevates it from the mundane. The relentless drumming from Powell is incredible. Tony Carey gets to entertain with a Moog synth solo that fits very nicely, but it has to be the awesome solo from Blackmore that is the real highlight of the song. No pointless ‘noodling’ around here, but a perfectly crafted and constructed piece of solo guitar that is breathtaking – you can hear passages that would inspire virtually every rock guitarist to follow. His use of harmony on sections of the solo are delightfully thought out and executed. By the end of the track and side 2 you are left feeling breathless and exhilarated. In summary: a masterpiece, never bettered by the band or by the members in any individual capacity in the future, just ever so slightly let down by the 3 minute, 3 chord ‘pop’ song that closes side 1! The very 1st pressing of the album has a couple of very subtle details about it that distinguish from later repressings. 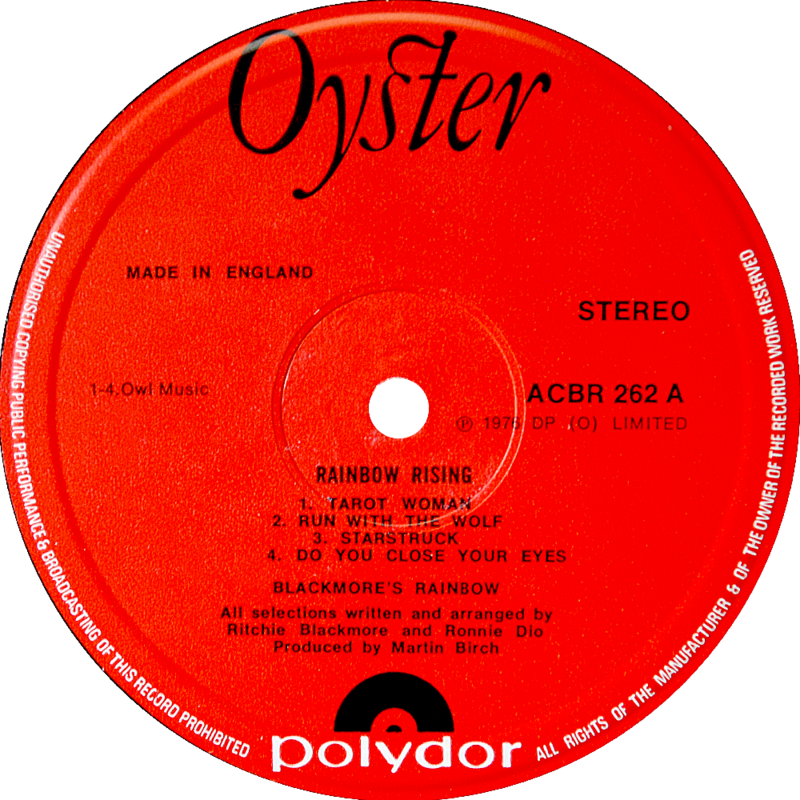 The original sleeve was printed by MacNeill Press, subsequent reissues were printed by Howards Printers (Slough) Ltd. The 1st issue label design has the words ‘Copyright Control’ on the labels, later issues credit the publishing to ‘Owl Music’. There is also an Audio Club of Britain (ACB) version that was issued with the catalogue number ACBR 262 – this has a mix of MacNeill Press sleeve and ‘Owl Music’ label. Totally agree, also on the ‘Do You Close Your Eyes’ remarks. Nevertheless, ‘Light In The Black’ is my personal favourite.